Your smartphone, watch, clocks, radios, and flashlights operate on batteries and soon, your house might too. Home electrical storage batteries have already hit the market as consumers seek renewable energy options and lower electrical bills. From powering medical equipment during a loss of power to charging your car at home, the benefits show how home electrical storage batteries are the wave of future. Home electrical storage batteries store electricity generated by solar power. The stored electricity can then be used to save money during peak hours where premium usage rates apply. Nighttime is an especially high-peak grid time for utility companies and the electrical storage batteries help offset consumption while still letting the homework and dishes get done. Starting this year, Tesla will begin offering solar shingles that are more aesthetically pleasing than the large, solar panels. CEO Elon Musk recently revealed that 4 types of shingles will be available and that the overall price tag is around $65,000. While more expensive than the standard roof, the solar roofs are expected to pay for themselves over time by saving money on electrical costs. No matter how a home receives its solar power, either via panels or shingles, investment in a rechargeable home storage battery is a must. Tesla’s Powerwall batteries are designed for homes while Powerpacks are designed for utilities. For example, Tesla’s Powerwall 2 is a 264-pound lithium-ion battery. The cells for the battery are made by Panasonic while the battery module and pack are made by Tesla. The battery mounts to a wall and stores 14 kWh of energy. To increase storage, consumers can link up to 10 batteries side-by-side. Tesla claims one Powerwall 2 unit is capable of powering a two-bedroom home for one full day. The company also believe they will be able to cut battery costs by 30 percent between 2018 and 2020 as its Reno, NV based billion-dollar Gigafactory (a partnership with Panasonic) hits full capacity. Natural disasters, blackouts, and powering crucial equipment such as medical devices are just some of the benefits of home electrical storage batteries. When Hurricane Maria hit Puerto Rico in 2017, Tesla sent several hundred Powerwall battery packs for the hospitals and medical centers. The battery packs turned out to be a lifeline for the island. Tesla is currently in talks with Puerto Rico officials about replacing their outdated and damaged grid with a renewable energy sourced grid. 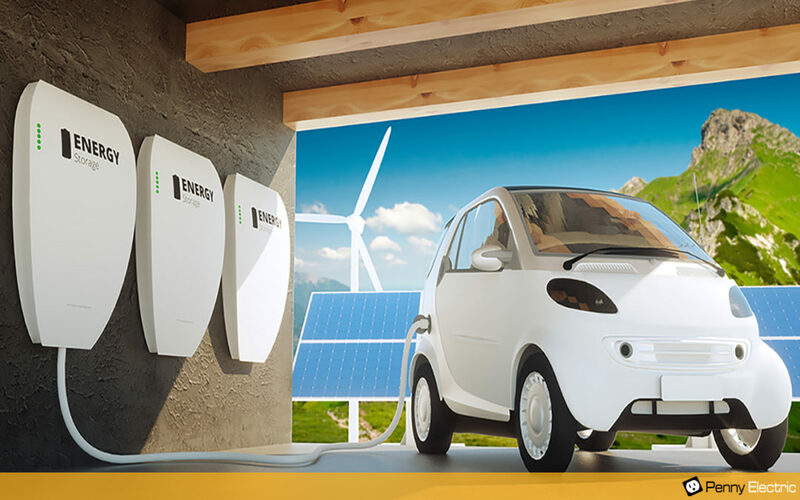 For those with electric cars, having a home battery system provides an additional cost savings and convenience. With a home battery system, EV owners can charge their vehicles without having to worry about what time of day it is or whether premium power rates apply. This is a huge benefit that contributes to the affordability of electric cars that shouldn’t be overlooked. It’s why automakers such as Nissan and Mercedes Benz are joining Tesla in the home electrical storage battery market. Nevada Energy provides residents with several options under their Renewable Generations Incentives. Residents can earn rebates for installing solar, wind, and other renewable technologies for homes and businesses. SolarGenerations Electric and SolarGenerations Heating are just two of the programs that provide rebates. The SolarGenerations Electric program has 2 categories: one for public, low-income, and non-profit and the other for residential, commercial, and industrial. Incentives are based on system size. Working with an approved contractor is highly recommended in ensuring the appropriate forms and procedures are completed before residents will receive rebates. Flipping a switch to turn on the lights is something that is easily taken for granted. And as technology advances to produce more sustainable ways to produce energy, learning about incentives is a wise investment of time. Solar power coupled with home battery systems is a great way save money, insulate yourself from rising energy costs and ensure a reliable source of power is always available at your home or office. For questions or assistance with the upgrade or installation of a proper infrastructure to support electrical storage batteries, contact us today or simply fill out an online request form here.